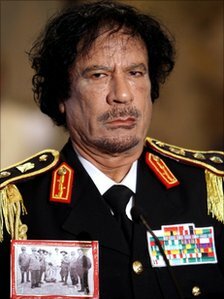 After nearly 42 years of power in Libya, Moammar Gadhafi has been killed. His death came as Libyan fighters defeated Gadhafi's last holdouts in his hometown of Sirte. The flamboyant tyrant who terrorized his country and much of the world during his 42 years of despotic rule was reportedly cornered by insurgents in the town of Sirte, where Gadhafi had been born and a stronghold of his supporters. "We have been waiting for this moment for a long time. Moammar Gadhafi has been killed," Jibril said at a news conference in Tripoli. He added that the rebel government will wait until later today or Friday to officially declare what it calls a state of liberation. The National Transition Council earlier today said that its fighters found and shot Gadhafi in Sirte, which finally fell to the rebels today after weeks of tough fighting. Rebels now control the entire country. Word of Gadhafi's death triggered celebrations in the streets of Tripoli with insurgent fighters waving their weapons and dancing jubilantly.